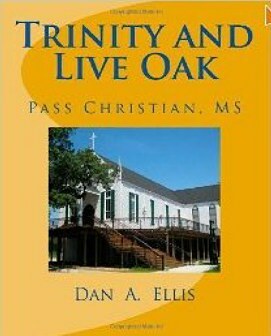 Trinity and Live Oak is all about Trinity Episcopal Church and Live Oak Cemetery in Pass Christian. The first part of the book is a history of Trinity Church and its role call of Rectors that begins with Dr. Thomas Savage — credited with being the first person to broadcast to the world about the African gorilla, its habitat, and its customs. In furtherance of the church’s history is the catastrophic destruction by Hurricane Camille of Trinity Church, which was built in 1849 — and its resurrection and re-consecration into a newly replicated Gothic edifice. 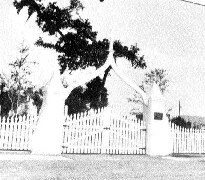 In a separate historic revelation, is the story of Live Oak Cemetery, beginning with its inception in 1851. In what Ellis refers to as a Storybook Land, is revealed in 130 pages packed with more than 350 photographs — most of which are grave side sights enmeshed within an enumeration of more than 1000 burial sites. These include plot descriptions, names, dates, places, espousal and parental relationships, and biblical and poetic statements as read from memorial inscriptions posted on monuments, pinnacles, stones, slabs, urns, etc. In a detailed research of the area known as the “Old Section” — the original 1851 deed transfer shows 154 plots measuring 20-by-20-feet with a capacity for 12 grave sites each. A special attempt was made to research each of the interred for an expanded notation of their life existence in Pass Christian. Relevant points of interest include community endeavor, public offices held, occupations, places of residence, children, and other community data.